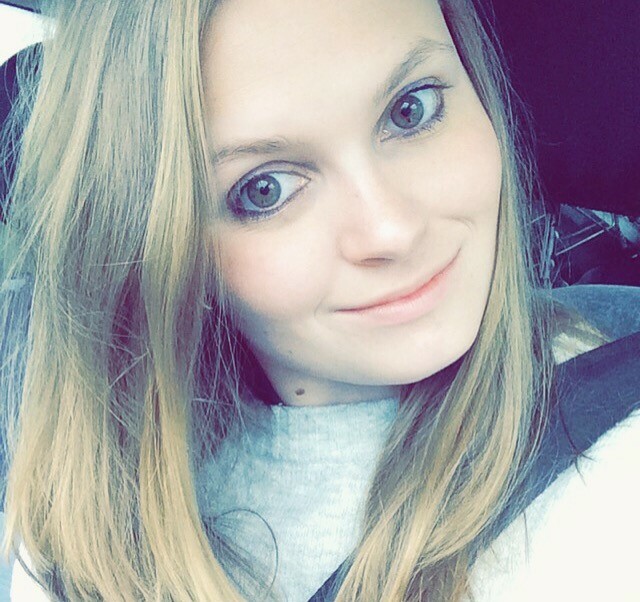 This post is a little late, but life has got crazy over the past few weeks. I had been umming and erring for months about whether I should sign up for Birchbox, then I saw that if you signed up in November you would receive a free full-size Nuxe Creme Fraiche Mask. This totally tipped the scales, and I instantly signed up, and I am so glad that I did. While waiting for my first box to arrive, I was as hyper as a kid on Christmas Eve. I wasn’t too sure what to expect from Birchbox, but I must say that when it finally arrived, I was pleasantly surprised. The Skinny Dip (for November’s box, Birchbox teamed up with Skinny Dip London) inspired box was much prettier than I had expected it to be. I instantly fell in love with the cute sea shell design. (Slightly out of season – it is winter, after all – but its prettiness makes up for that.) I also loved how the items were neatly packed into a simple drawstring bag inside the box – I’ll definitely be using this as travel bag for a few of my beauty products. So what was inside my box? 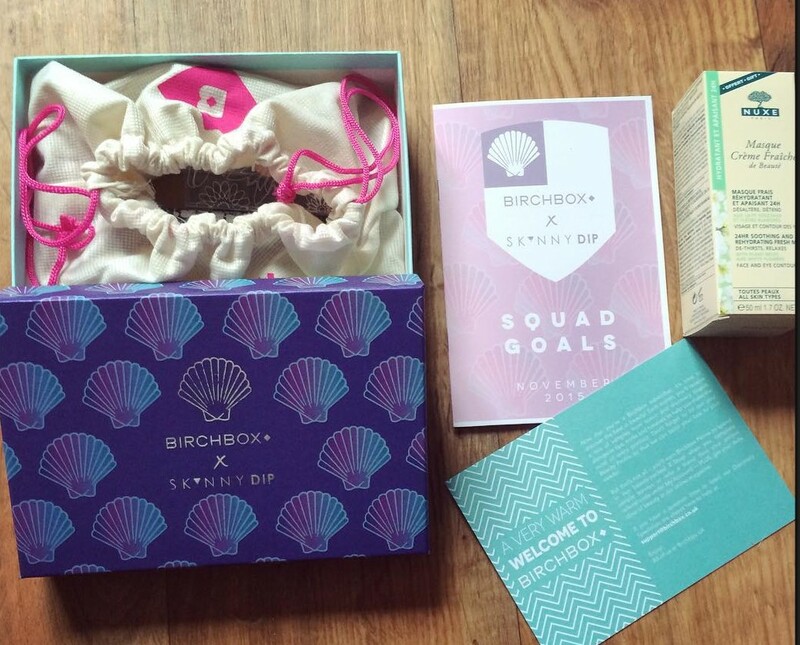 Thanks to the collaboration between Birchbox and Skinny Dip London, I had a £10 voucher to use on the Skinny Dip website. (I’m hoping to buy one of their lovely phone case, so this will come in handy.) As well as this, I had a welcome card, a guide to my products, and of course, a selection of bits and bobs to try. First up is the Pure & Light Organic Revitalising Facial Exfoliation (full size RRP £25), an exfoliating cream that works to give you smooth, radiant and glowing skin. Made up of a blend of berry seeds, arctic oats, and silica, this facial scrub is perfect for firming the skin and getting rid of dry and dead skin cells. What did I think of it? Following the instructions to apply to damp skin, I gently rubbed a small amount of the exfoliating cream into my skin. Unlike any exfoliators that I have used before, I found that this one was much lighter, and the base was more like a face cream than anything else. While I liked how gently this exfoliator works, I found that for skin that’s prone to drying out, like mine, it didn’t offer satisfactory exfoliation. Next is the sample of Delarom Creme Aquaconfort (full size RRP £34), a rejuvenating cream that’s made up of a combination of almonds, apricot oil and vitamin E. This gentle cream helps to soothe and hydrate, giving your skin a boost of nourishment – perfect for this time of year. Did I like it? When I first applied this cream to my skin, I was a little disappointed because of how light it was. As I suffer from dry skin, I usually tend to prefer richer creams, as I find that they work better with my skin. To my surprise, however, even though it was incredibly light, this cream gave my skin a real boost. It was gentle and soothing, and left my skin feeling hydrated for hours – I couldn’t believe it. Moving on, next is the POP Beauty Eyeshadow Trio in Peach Parfait (full size RRP £15.50), a mini version of POP Beauty Bright Up Your Life eyeshadow palette. This cute eyeshadow trio is one of the products that I was most excited about, as it’s just so pretty. As well as working well as shadow, this palette also doubles up as colourful eyeliner. Pretty cool, right? So, do I like it? Do I like it, nope, I LOVE IT! At the mo, I am a little obsessed with eyeshadow, so was super excited when I opened my box and saw this little gem in there. I tested the three beautiful colours out on my arm and couldn’t believe how pigmented they are, not to mention how lovely and glittery they are. Winter is the time of glitz and glamour, and these cute little shadow colours are ideal for taking your look to the next level. Now onto my only full size product, Cowshed Cow Pat Hand Cream (RRP £8), is a nourishing lotion that smells AMAZING. Packed full of essential oils, including grapefruit and coriander, this lovely little cream is ideal for soothing sore, dry hands, making it a handbag must-have for winter. Would I buy it myself? Yes, I totally would. It not only smells amazing, but is easy to apply, soaks in easily, and is fantastic for dry skin – something that I’m prone to, so is perfect for me. While a slightly lighter hand cream than I’m used to, the amount of nourishment it provides is amazing. Plus, the fact that it’s free of parabens and sulphates makes it even more appealing in my eyes. My final product was a teeny theBalm cosmetics Frat Boy Blush/Shadow (full price RRP £15.50), a blusher combined with an eyeshadow that gives a rosy glow to all complexions. What do I think of this? While I love the high piments of this product, at £15.50 for the full size, I’m not sure if I would buy it myself. I like the colour of it as a blush, as well as an eyeshadow, but I’m still not sure about the higher than average price. This month, for my beauty treat – a little Birchbox extra, I received a sample of English Laundry Notting Hill Femme Eau De Parfum (full size RRP £60). This is a brighter, more feminine alternative to the classic men’s scents that the company make. As well as my beauty treat, as a thank you for signing up, Birchbox also sent me a full size NUXE Creme Fraiche Mask (RRP £18.50).